We did say right at the start of this live page that Hibs and Rangers don't do "dull". We got a riveting night of football, chances galore, end-to-end fare, crunching tackles, a late red card, a scuffle on the park, and a free-kick off the crossbar with the final act of the match. Unfortunately, what we also got was another high-profile instance of fan misbehaviour, which will no doubt attract plenty of media coverage tomorrow morning and beyond. Scottish football has quite the problem on its hands. Meantime, that's just the start of the live action across BBC Scotland this weekend. We'll be back online tomorrow with live coverage of four more games, including Aberdeen's trip to Celtic. Join us again for that one and enjoy the rest of your night. Rangers boss Steven Gerrard is distinctly unhappy about what he felt was a foul on James Tavernier in the build-up to the Hibs goal. He also says Rangers are "not in a title race because of nights like tonight". They narrowed the gap on Celtic at the Premiership summit to seven points but their rivals can go 10 clear if they beat Aberdeen at home tomorrow. "We’re leaving here very frustrated but we’ve got ourselves to blame," Gerrard told BT Sport. "We were very excellent first 45 minutes, very dominant, created chance after chance, but we weren’t clinical and ruthless enough. We only managed to get one goal in front but the game should have been done. "Second-half, Hibs improved, it was a bit more of an up-and-down game, but we’ve got ourselves to blame for the result tonight. "I’m interested in the one decision that’s cost us three points tonight. The referee is five yards away from it and it’s a blatant foul, 10 times out of 10, 100 times out of 100 [on Tavernier]. You can talk about VAR, talk about supporting referees, but it’s impossible to support a referee if he cant give a foul five yards away. "It damages [Rangers' title aspirations] even more. It was a big gap before tonight, but we had an opportunity to close the gap to five points. The reason we're not in a title race is because of nights like tonight. You can afford one a season but we've had five or six now." More from Paul Heckingbottom who didn't know too much about the Tavernier-fan incident at the time of the interview, but had some strong words on fans engaging in such activities. "I should be here talking to you about how proud I am of the players and yet again I'm getting asked questions about fan misbehaviour," he said. "We need it to stop. We've got a product up here, you've seen an exhilarating game of football but the talking point is now going to be things we don't want to see. "It's sad I'm not here raving to you about how proud I am of the players; I have to speak about something else. "It's certainly not as prevalent [in England]. There was a hell of a lot done down south in terms of changing refereeing, stewarding, safety at grounds. There is a lot more money behind it as well. But it was done and people invest in it because of the product and they could then bring even more money in. "Up here, on the pitch we've got a great product. The game today had everything. But if you want to sell it as best you can, fans are representing our club, we need them to behave. Everybody involved in Scottish football needs the best possible product on the pitch so everyone has to get together to deal with it." Hibernian head coach Paul Heckingbottom praises his side's effort and tenacity to haul themselves back into the game after a bruising first half. "That had a bit of everything. Rangers were superb first-half and we had to really dig in to stick with him, it’s as much the defenders making challenges and blocks last-minute that got us the point as it was the forwards’ running power and quality that got us the goal and created the chances second-half, so a truly all-round performance," he added. "At half-time we said we were taking the best they were throwing but we then had to lay a glove on them. We had to make a tactical change, and credit to the players because it’s something we’ve not really worked on, going to a three higher up and getting two more advanced midfielders to press higher up. Our sheer willpower got us back in the game and allowed us to create better chances. "We couldn’t accept being second-best. You’d rather lost 2-0 or 3-0 trying. Certainly second-half we weren’t second-best and as the game wore on I thought it was us that were going to get the winner. The players have more than matched Rangers’ work rate and commitment. "We took a point from it but we took a lot more in terms of the spirit of the players." Dempster says "nothing is off the table" as Scottish football seeks a lasting solution to fan misbehaviour after a spree of recent incidents. "There is a big debate, a healthy debate going on in the Scottish game," the Hibs chief executive added. "But I’m going to bring it back to personal responsibility. Who thought it was okay to come in here with a glass bottle and throw it? Who thinks it’s alright to jump over an advertising hoarding. Ninety-nine-point-nine per cent of the people in here don’t’ think it’s okay and we ought to remember not to tarnish these guys as well. But this person and people like him are going to feel the full weight of what we can deliver and hopefully what Police Scotland can deliver as well." We understand the man who confronted James Tavernier on the half-time whistle has been arrested. It follows the incident here six days ago where a supporter in the East Stand threw a glass bottle at Celtic forward Scott Sinclair. Leeann Dempster issued a strongly-worded statement on fan behaviour and apologised to Sinclair this week, but, clearly incensed, the Hibs chief executive tells Sportsound "a statement on the website is clearly not coming through". "Everything that has been written and said in the last week given what happened here with Scott Sinclair, to see this supporter – I’m not even going to call him a supporter – to see this idiot coming on to the pitch, I’m going to use the word unacceptable," Dempster added. "I said it last week which is why I’ve decided to come down and speak to you guys personally. A statement on the website is clearly not coming through. They’ve embarrassed this club tonight again, it’s completely and utterly unacceptable. How many supporters came into the stadium to enjoy what was a really good game and what are we going to be talking about tomorrow? What is going to be on the back pages of the paper? What are you going to be asking me about? You’re going to be asking me about this utter idiot. "We’re very hard on supporters who misbehave. Maybe we don’t talk about it enough, maybe we should talk more about it. This individual will be banned for life from this stadium. He’s in custody at the minute and that’s where he should remain as far as I’m concerned. I had to write and apologise to Scott Sinclair this week which was absolutely the right thing to do. I’ve asked to speak to Mr Tavernier when he’s ready before he leaves to personally apologise to him because it’s unacceptable. "But I would also like to say there are so many other people who came here tonight and enjoyed a brilliant game of football but this person has let us down badly again and I’m raging, I’m furious." 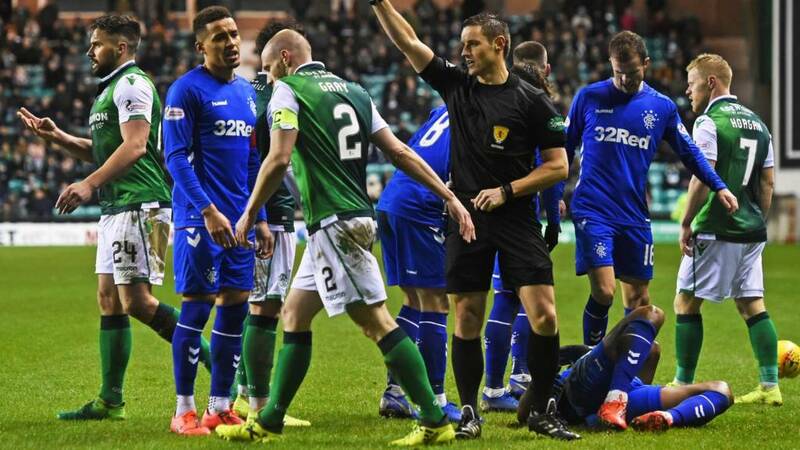 We're about to hear from Hibs chief executive Leeann Dempster after the half-time incident involving a fan and James Tavernier. Quote Message: You can say Rangers dipped but you've got to give Hibs credit. They got closer to people, they had to adjust their system, because in the first half they hardly got close to Rangers. They stuck at it. You can say Rangers dipped but you've got to give Hibs credit. They got closer to people, they had to adjust their system, because in the first half they hardly got close to Rangers. They stuck at it. No shortage of action to dissect at Easter Road. This is your last chance to rate the players' performances. Quote Message: A really good managerial performance from Paul Heckingbottom to adapt things a little bit to change the flow of the match. The players became a lot more secure, a lot more comfortable through the middle of the pitch. But more importantly, they looked a bigger threat. McNulty was man of the match for me - his movement was everything you're looking for from a striker, a man whose side were battered in the first half. A really good managerial performance from Paul Heckingbottom to adapt things a little bit to change the flow of the match. The players became a lot more secure, a lot more comfortable through the middle of the pitch. But more importantly, they looked a bigger threat. McNulty was man of the match for me - his movement was everything you're looking for from a striker, a man whose side were battered in the first half. That's the last kick of the game. What an enthralling, riveting night of Scottish football we've had! Rangers and Steven Gerrard will be utterly furious they haven't won this. They had an absolute mountain of first-half chances but only managed to find the net once when Daniel Candeias curled home a peach of a shot. As the half-time whistle sounded, Rangers captain James Tavernier was confronted by a pitch-invading fan, who was swiftly grappled away by the police. Hibs changed their shape at half-time and looked much better for it. Rangers continued to dominate but Hibs grew into the game and hauled themselves level when Florian Kamberi fired home after a fantastic spin, run and cross from Marc McNulty. Both sides could have won it in the end. Stevie Mallan's shot was deflected over from point-blank range. Andy Halliday hit the bar with the last kick of the game. In the end, it's a point apiece, a point that will be celebrated much more raucously in Leith than Govan. Hibs are still the only Premiership team Gerrard has not conquered. It's off the bar! Andy Halliday takes the free-kick and clatters the top of the crossbar with his dipping effort. So close to a winner. The free-kick finds the head of Connor Goldson but it's too high and too fast for the defender to direct his effort on target. We're into the 95th minute now. Rangers have won another free-kick and this one is in a really inviting position, 25 yards out, right in centre-field. Will James Tavernier fancy this one...? Quote Message: It was actually a good foul in the end. It was actually a good foul in the end. We reckon, in the wake of that flare-up, yellow cards have been shown to Paul Hanlon, Marc McNulty and Ryan Jack. Marvin Bartley is sent on as Hibs look to defend this free-kick 35 yards out. Can Rangers win it at the death? This is bonkers! Daryl Horgan passes the ball straight to a Rangers player as Hibs go in search of a winner. Off go the visitors and Jermain Defoe is cynically brought down by Darren McGregor. He knew what he was doing, he knew he would be shown a yellow card. He had to take one for the team. There's a bit of a scuffle between the players but the upshot is Hibs will finish this game with 10 men. Now it's Hibs who menace, with Kamberi, Stevenson and Horgan combining. David Gray arrives up the right but his cross drifts just beyond Kamberi and out for a goal kick. Kamberi is going to be booked now for booting the ball away after Omeonga fouls Candeias. Hibs still haven't made a substitute. Stephane Omeonga nicks the ball away as Rangers power forward and Joe Worrall goes clean through him. It's a booking for the Rangers defender - he won the ball but it was a bit on the reckless side.